Cupid on Red Heart. Colorado charm. Experience the guiltless joy of loving life without limits! Fashioned onto a nickel-free stainless steel, the charm displays an amiable Cupidon holding a heart and standing guard over the interest of love. The picture is painted in bright colorful enamel and set upon a glittering stainless steel support. Gorgeous gold toned casing of a heart makes a great contrast to a polished link that is fixed to a medium size. 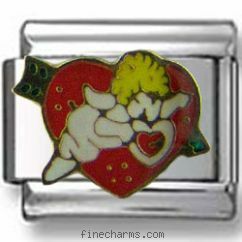 Combine I heart you Enamel or Sweet Heart Italian charms for a romantic look on your bracelet.